Don’t you love this festive time of year? Christmas seems to give us the most beautiful creations in every category, and papercrafting is no exception. For example, check out this adorable shadow box! Wouldn’t you love to decorate your home with something like this? We can’t decide what we like best about it: the holly berry gems, glittery lettering, or dainty snowflakes. And you’re probably dying to put your favorite family picture inside the frame! We have the lovely Michelle Snyder to thank for this beautiful piece of artwork—some of our readers will recognize it from Convention, where she donated it to our Operation Smile™ auction. Look how great they turned out! Don’t you want your own now? Well, you’re in luck—Michelle wants as many people as possible to have access to her instructions, so with her permission and blessing, we’re sharing them right here on the blog! This will give all of you the chance to make this Christmas masterpiece in time for the holiday season. We’re so grateful for Michelle’s inspiring artwork and giving spirit. Thank you, Michelle! 🙂 Now check out her instructions at the link below, and merry crafting! P.S. 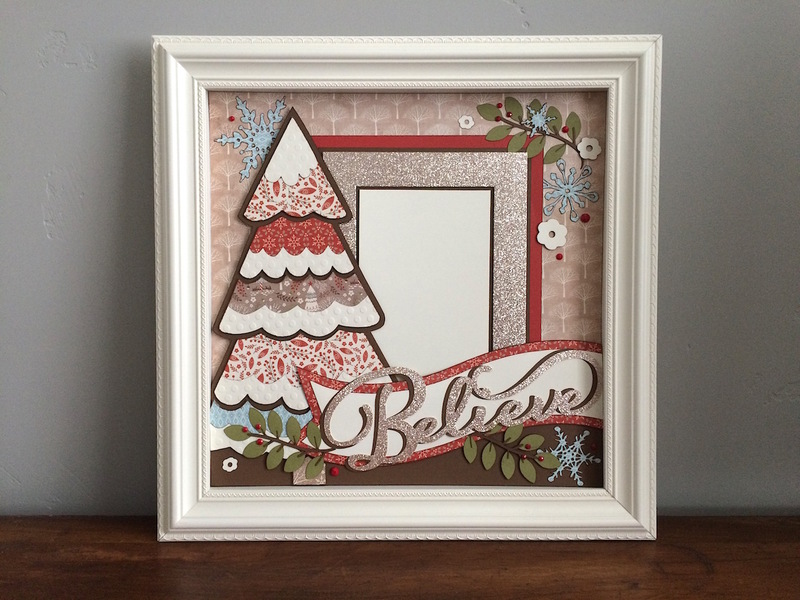 Before you start work on your shadow box, you’ll also need the White Pines paper packet. It’s only available for another month, so make sure to order it right away! For more White Pines artwork inspiration, search #ctmhwhitepines on Pinterest, Instagram, and Facebook. We’ve all done it: dwelt on the thought of that thing we just don’t have. But how often do we think about that thing that we do have—or, let’s be honest, the MANY, even innumerable, things? There are blessings in our lives we cannot count in the typical sense of the word. It wouldn’t be possible to assign a number to all of the miracles we see on a daily basis! But we can “count” our blessings in so many other ways. In our words, and especially in our attitudes, the world can see our grateful hearts. Throughout this month, we at Close To My Heart want to celebrate the joy of gratitude—both of feeling it and of showing it, because, as William Arthur Ward once said, “Feeling gratitude and not expressing it is like wrapping a present and not giving it.” Whether or not you celebrate your gratitude with a turkey this month, you can join us as we experiment with creative ways to say thank you. First off, a simple and beautiful way to display your gratitude: the Designed Décor Colonial White frame! 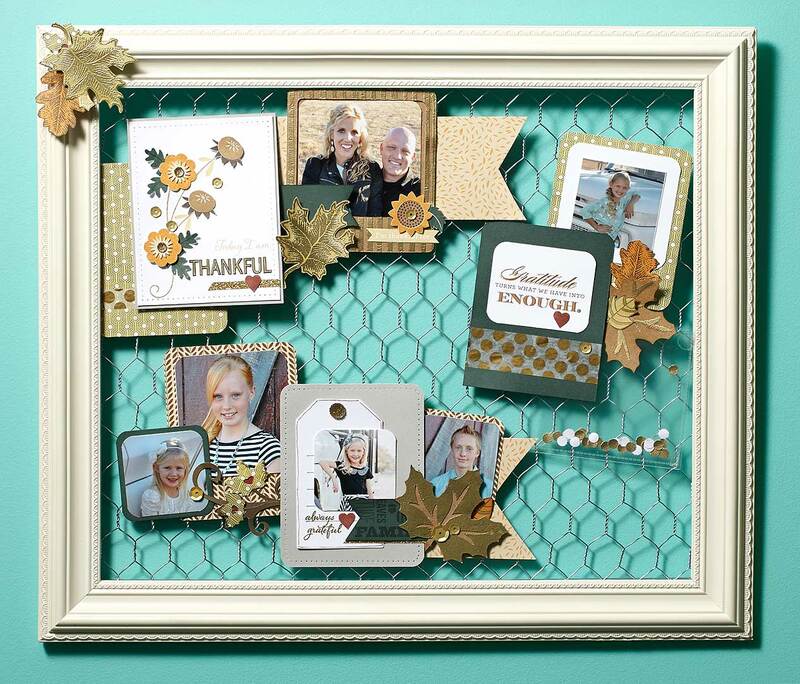 With the help of the Pathfinding and Wanderful paper packets, delicate golden embossing, and several fun stamp sets, this frame is a showcase of gratitude. The beauty of a display such as this is its accessibility and versatility—you can swap out photos as often as you like! If you want to focus on a certain family member every week (or every day, if you’re feeling ambitious! ), fill it with pictures of only them. If you want to focus on a different aspect of your life every few days, group your pictures beforehand and have them ready to swap out: family, pets, nature, neighbors, friends, specific life events. They’re so easy to rearrange, and just a few themed shapes cut from your Cricut® machine will accent your photos nicely. Use a mini clothespin, hook clips, 3-D foam tape, or Glue Dots™ to attach your photos and artwork. What a wonderful way to jumpstart your gratitude for the series of fortunate events that is your life. Tell us, in what ways do you display your gratitude?